to serve, to receive and create space to rest in the presence of Jesus. Our morning services run from 10:30am(ish) - 12:00pm. Our morning gatherings create space to hear from the Holy Spirit. We have fellowship and prayer with one another and with prayer and thanksgiving give glory to God. We have breakfast with one another before our service, so we would encourage you to get there slightly earlier so you don't miss out on the wonderful food and gathering of family. We also do lunch together twice a term as a church! For more information on what goes on at St Peter’s email: parishadmin@chesterstpeter.org.uk and ask to be signed up for our weekly email. Also, if you have missed a sermon or just fancy hearing a talk again - please do use the button below and listen! 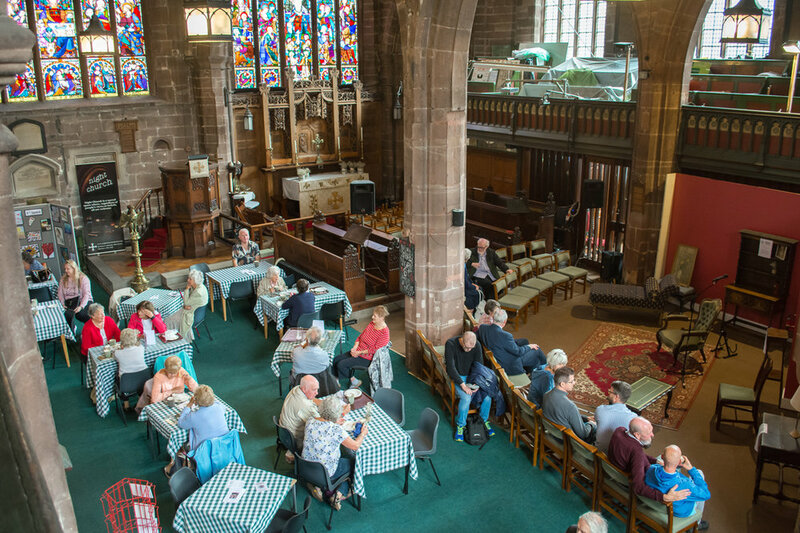 On Tuesday's we have our lunchtime services which are held at our daily Café At The Cross. This service is a place to meet, pray and worship in the midst of day to day life. It's also an opportunity to receive teaching from our speakers, to be encouraged, find rest and be strengthened in the middle of what can be an extremely busy time. Our monthly Contemplative Eucharist is a short (45 minute) service of Holy Communion in a quiet and reflective setting. Each month we include a contemplative practice before we receive bread and wine. The service is open to all, and is especially suited to those who are seeking to deepen their prayer life and their devotion to Jesus in the Holy Eucharist. Services are every 2nd Sunday of the month at 5.30pm. We offer the facilities and capabilities for baby baptisms and full body immersions. If this is something that you would like more information about, or you would like to enquire further into having yourself baptised and/or planning a baptism then please contact Jonathan Phillips at parishadmin@chesterstpeter.org.uk. We love weddings, and we love the celebration and commitment that two people make to one another through marriage, and sharing this with friends, family and everyone in-between. St. Peter's, please contact parishadmin@chesterstpeter.org.uk. We are able to offer the facilities and capabilities for funerals to be spoken through about, planned through and hosted in St. Peter's with all necessary legal requirements. To discuss planning a funeral please contact parishadmin@chesterstpeter.org.uk and we will get back to you as soon as possible.